Marya and Eric gave me an awesome early birthday present - the card game Dominion. Brian and I were introduced to the game by Mar and Eric in Belleville about a month ago, and both really enjoyed it - and, since we now own the game, we introduce as many people to it as we can! In the past month, we've played the game around 25 times. Last night, while playing with Marty and Rachel, I won for the first time. It was awesome! The great thing about this game, however, is that it's still super fun even if you don't win - of which my 1 and 24 game history is proof! We played a lot in Sarnia this past weekend with Adam, Lisa, Shanna, and Brian's mom. I won a game there, for about 10 seconds, until Shanna admitted that she stole one of Adam's 6 pointer victory cards and that put him at about 3 points above me. Sigh. Sorry for the repetition, and I realize that watching a baby playing with toys isn't nearly so exciting when it's not your baby, but I'm amazed at Hendrik's growth curve this week! It wasn't until very recently that he even started paying attention to his toys - now he grabs them and puts them in his mouth, with purpose! Compare the video I took today with the one I took 3 days ago if you don't believe me! Playing is Hendrik's newfound skill. He's not a very gentle player and tends to smack himself in the face with whatever it is that he finds his hands grasping. Meet Mr Grumpy Pants. He doesn't enjoy most of his time awake in the afternoons. We get smiles here and there, and even some almost laughs. But, we also get a lot of this. I appreciate the fact that he still takes about two naps in the afternoon. 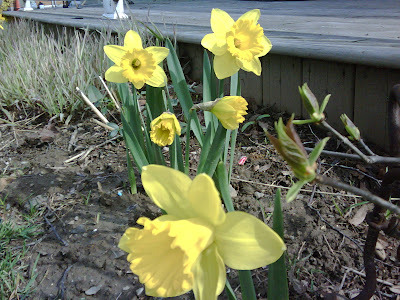 As seen in my front garden this afternoon: Cheer!